Linear equations review and a bit of sarcasm as we head into Portfolios. I really should just be glad they recognize that we’re reviewing material they (theoretically) already saw and know (unless they’re one of the mountain of new kiddos who arrived in the last month). One of the quirky things about working in a school with lots of recent immigrants is that we can never quite be sure what they’ve learned prior to being at our school. State standards? Fantastic. They don’t apply out of the country, though. One of the gaps that we generally count on is fractions, which are typically taught in middle school in the United States. They come up frequently on the state exit exam and are good to know about in general. On Friday, Monday and Tuesday, curriculum partner and I split our classes in two. 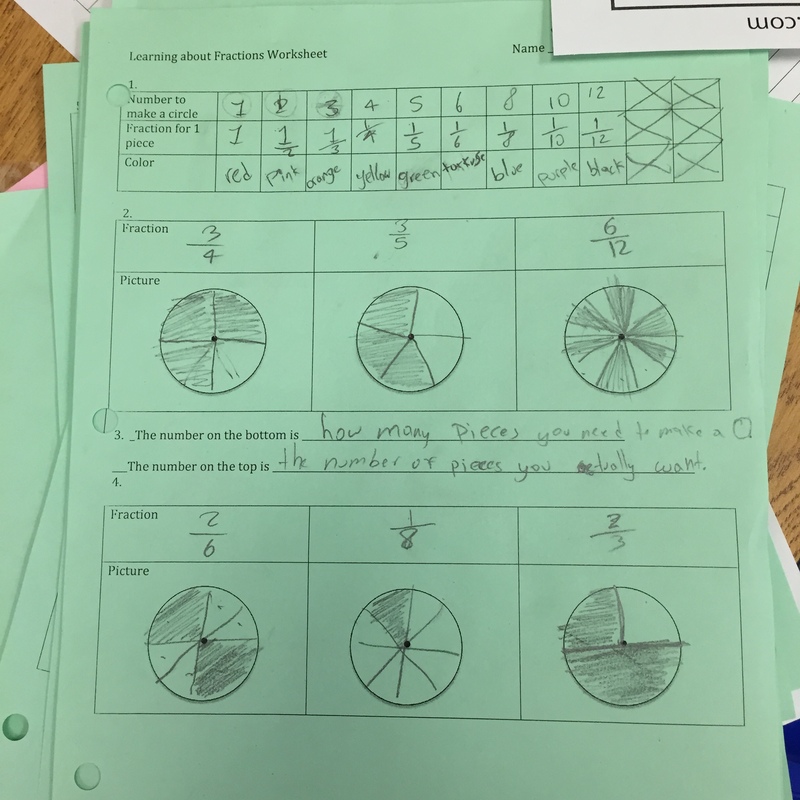 Some students worked on fractions with the pie pieces and some students working on writing steps to solve equations. Today, students who learned about fractions taught the rest of the class how to use the pie pieces, how to write fractions and how to write and find equivalent fractions. This worksheet is from a student where the teacher admittedly struggled at first, but pulled off a pretty strong showing. The student who wrote this is a pretty good artist and despite many ups and downs, was pretty engaged (there were also 6 adult visitors in the room – one for each group and enough to engage our students while pushing their thinking). I wonder why this student (and others) sometimes shade in non-consecutive pie pieces (see 6/12). I also observe that most of their pie pieces are the same size (except for 2/3), which is not always a given with our students (especially those with Formal Interrupted Education, which I do not think applies to this student).